50 million-years ago, the heir to Tyrannosaurus stalked the forests of ancient Europe and North America, snapping up the tiny ancestors of horses, cows, and wolves in its colossal meat-cleaving beak. Gastornis was a six-foot-tall, flightless bird and the king of the food chain…or that’s what we thought. For decades paleontologists looked at the huge, parrot-like head and thought the giant bird must be a carnivore, but a recent, exhaustive study drew on molecular evidence, anatomical evidence, and ecological evidence to show Gastornis was a giant herbivore! The former terror bird likely used that massive beak to crack open the abundant seeds and leaves that would have littered the forest at the beginning of the Age of Mammals. Tune in to Past Time to learn how the fossil Terror Bird became Big Bird! To listen to the episode or subscribe to the podcast through iTunes click here. To download the episode audio file directly click here or to stream it through your browser without downloading it at all click here. For images of Gastornis terrorizing mammals and to understand the lines of evidence used by paleontologists to shift the giant bird to a greener spot in the food chain click below for the full story and images! Gastornis the terror of the Eocene? 66 million years ago a massive object from space smacked into the Earth, ending the Mesozoic Era and the reign of dinosaur superstars like Tyrannosaurus rex and Triceratops. But it didn’t mark the end of the dinosaurs. Birds managed to survive the extinction event and soldiered on. Most birds have stayed small and airborne, but during the Late Paleocene and Early Eocene (about 50 million-years ago) the forests of Europe were stalked by a new bird experiment that seemed like a return to their non-avian dinosaur roots: Gastornis! This six-foot tall bird (1.8 meters) was flightless and, unlike modern flightless birds such as ostriches and emus, Gastornis had a briefcase-sized head with a large, sharp-edged beak. When Gastornis was first discovered over 100 years ago, the French team responsible for the discovery knew it was big, but didn’t fully appreciate the meat-cleaver-like beak the animal would have carried. As specimens were discovered in North America (then called Diatryma but later recognized as the same giant bird the French had discovered) the skull began to take shape and paleontologists knew Gastornis had a head unlike any other flightless bird. The world Gastornis live in was a diminutive ecosystem with few animals larger than a pig wandering the woods. From the perspective of tiny mammals, Gastornis was a giant with a razor-sharp beak. Without a living animal to compare to the giant bird, paleontologists hypothesized the 6-foot-tall bird was chomping down on tiny mammalian prey as a top carnivore. After all, if Gastornis was a giant herbivore, it should have a small, delicate head like a modern ostrich, emu, or cassowary, right? Over the last couple of years, paleontologists started taking a hard look at the carnivorous Gastornis hypothesis. One group of paleontologists in Washington State found a trackway from the Eocene, when Gastornis would have been walking around. By studying the footprints of the giant bird, they determined the animal didn’t have large claws or talons, a pretty convincing indication of a more docile bird. Then, a few years later a German research group lead by Thomas Tütken studied the calcium in the fossilized bones of Gastornis and found the calcium used by Gastornis to build its bones was similar to herbivorous animals, not carnivorous animals. But it would take a larger study of bird bone chemistry to really investigate the part Gastornis played in its jungle ecosystem 50 million-years ago. Delphine Angst with a Gastornis bone. 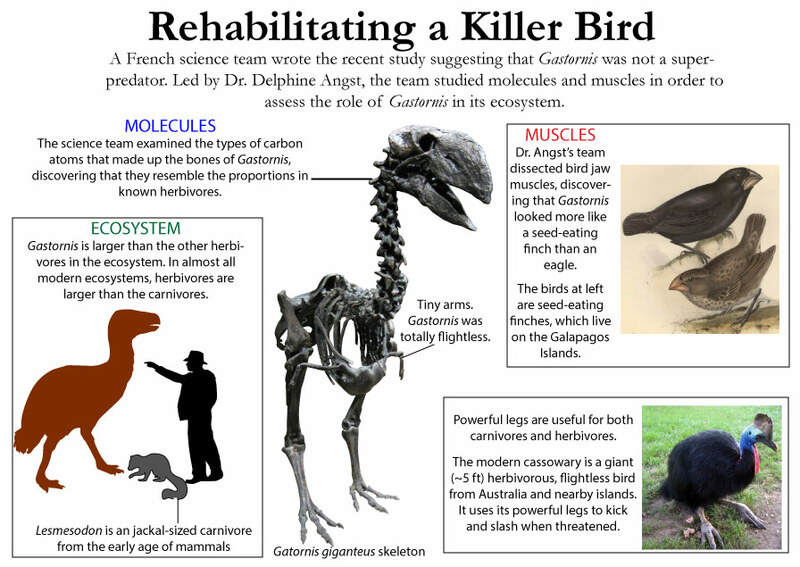 In early 2014 the French researcher Delphine Angst and a group of collaborating paleontologists published a new study of Gastornis that used three different methods for examining the giant, flightless bird’s behavior. One clue to the beast’s behavior came from the anatomy of that huge beak. The size of muscles used to close the beak can be an indication of diet in many modern birds. Herbivorous birds like finches and chickens often have large jaw-closing muscles because seeds and leaves can be pretty tough to chomp through. Carnivorous birds like hawks and falcons have small jaw-closing muscles because meat is a little easier to slice open. Many muscles leave evidence of their attachment points to bone on roughened bone surfaces or even large projections that stick off of the bones. The muscles of Gastornis rotted away millions of years ago, but the team could still study the structure and strength of those muscles by looking at where they attached to the cranium (the upper part of the skull) and the mandible (the jaw). 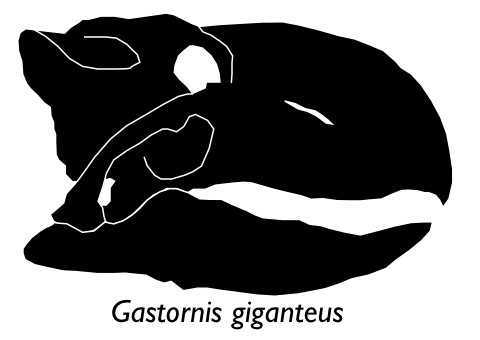 Angst and her team measured where a jaw-closing muscle called the external adductor attached to the cranium and mandible in modern birds and in Gastornis and discovered Gastornis‘s muscles were built more like a finch than a falcon. The next clue to the herbivorous habits of Gastornis came from the carbon locked in the bones of the big-beaked bird. Carbon is a chemical element found in all living things. This atom is able to link up with other atoms like oxygen to form all sorts of chemicals necessary for life, including the minerals and chemicals that build and grow bone. But all carbon isn’t exactly the same size. In the atomic core of some carbon atoms are fourteen neutrons (called Carbon-14), other carbon atoms have thirteen neutrons (called Carbon-13) and still others have twelve neutrons. That variation in neutrons doesn’t affect the chemical properties of the carbon atom but it does make them a little bigger or a little smaller. Atoms with the same chemical properties but different numbers of neutrons are called isotopes. Living organisms prefer to build chemicals with the carbon isotope Carbon-12, but they will use Carbon-13 if it’s handy. Plants get their carbon from the air and soil and they end up using some Carbon-13 and a lot of Carbon-12. 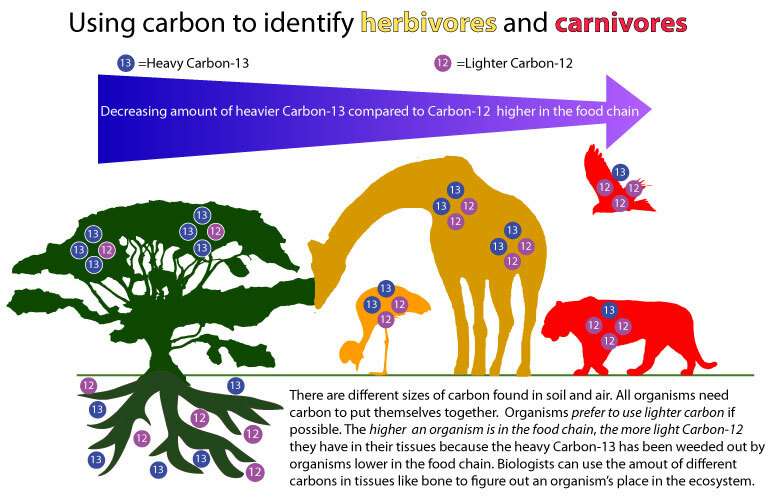 When an herbivore eats the plant, the chemical reactions that break down the plant’s tissues and build new tissues for the herbivore favor the Carbon-12, so the herbivore has more Carbon-12 than Carbon-13 than the plants. And finally, the carnivore that eats the herbivore gets its carbon from the tissues of the plant-eater. The chemical reactions in the carnivore that make new tissues prefer to use Carbon-12 and ditch the Carbon-13. In the end, carnivores have the smallest amount of Carbon-13 in their tissues of all organisms in the food chain. Angst and her colleagues mashed up some of the bones of Gastornis and found more Carbon-13 than they would have expected if Gastornis was a carnivore eating herbivores. Instead, the amount of Carbon-13 compared to the amount of Carbon-12 was more like the isotope levels found in plant-eating animals. Finally, the French team looked at other ecosystems around the world and observed that the largest warm-blooded animal in an ecosystem is never a carnivore. It takes a lot of energy to be a carnivorous animal, so they tend not to outnumber or outgrow their prey. If Gastornis, the largest animal walking through the forest, was surviving on meat, then we have a really weird ecosystem in France 50 million-years ago. Instead, the largest animals are usually eating plants because plants are plentiful. Using the evidence from the muscles, carbon isotopes, and ancient and modern ecosystems, Angst and her fellow paleontologists put together a very convincing case that Gastornis was not running through the forest chomping down on the tiny relatives of rhinos, horses, and elk, but was one of the first large herbivores to evolve in Europe. With Gastornis recast as an herbivorous giant, new research questions can be tackled: What plants may have relied on the guts of Gastornis for germination? How did Gastornis fit into the North American ecosystem as an herbivore? And what do giant bird dominated ecosystems like ancient Madagascar or New Zealand have in common with Eocene Europe? As these questions are researched and answered, we will keep you updated here at Past Time! Episode 6 Field Guide: Tiny Horses, Galloping Crocs, and Fossilized Jungles If you want to spend more time with little horses and tiny carnivores, check out episode 6 of Past Time where we discuss a fossil site in Germany that preserves the weird jungle world that popped up a couple million years after the non-avian dinosaurs went extinct! Walking with Prehistoric Beasts (or Walking with Bests in the UK) by Tim Haines (2001) is the companion volume for the documentary series Walking with Prehistoric Beasts which details life in extinct ecosystems during the Age of Mammals. The first episode of the series covers the European Eocene when Gastornis was stalking around. In the documentary Gastornis is presented as the Big Bad Guy which likely isn’t accurate, but the animations of the forest and its other denizens is still accurate (as far as paleontologists know) and it’s a lot of fun to watch (and discuss). Magnificent Mihirungs: The Colossal Flightless Birds of Australian Dreamtime by Peter F. Murray and Patricia Vickers-Rich. In case you haven’t gotten enough about giant flightless birds with enormous beaks, check out this book on a group of birds unrelated to Gastornis that roamed Australia millions of years after the European giant went extinct. Mustoe, George E., David S. Tucker, and Keith L. Kemplin (2012) Giant Eocene bird footprints from Northwest Washington, USA. Paleontology 55: 1293-1305. Tütken, T., P. Held, and S. J. G. Galer (2013) Isotopes in vertebrate bioapatite: proxies for climate, pCO2 and diet. Goldschmidt Conference Abstracts. Mineralogical Magazine 77: 2368. 4 thoughts on Quick Bite Field Guide: Terror Bird or Gentle Giant? Love this post, I just wish you would not have called it a terror bird. Gastornis is only distantly related to actual terror birds. People might mistake the idea of Gastornis being a gentle herbivore for all actual terror birds. However, keep up the great work. Great blog and podcast. Excellent point, Nobody! “Terror bird” is a name usually applied to a group of birds called phorusrhacids, 10+ foot monster birds that were almost certainly deadly predators. Theirs is a story we will tell in the future. Enjoyed the post. Thanks for the carbon-12 and carbon-13 descriptions. Very informative! 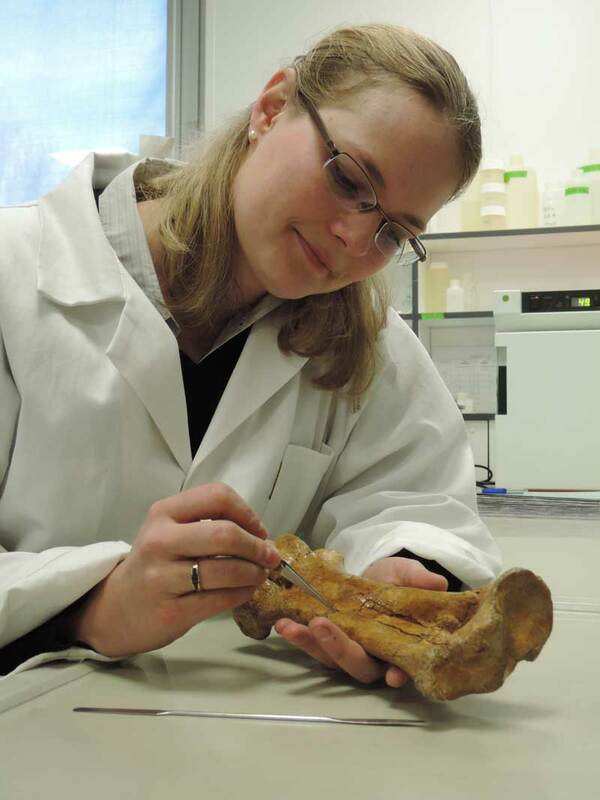 What a wonderful bit of scientific sleuthing by Dr. Angst and her colleagues. A great example of thinking outside the box and using technology to better understand these fascinating creatures. I am one of the authors of the paper (Mustoe and others, 2012) describing the Gastornis/Diatryma foot tracks in the Chuckanut Formation in Washington State, USA (the genus is still Diatryma in North America, pending revision). The paper presented our evidence for vegetarianism in these giant birds based on anatomical clues in the footprints. We found a number of tracks; our hearty crew of volunteers rescued the best ones from fossil hunters. One track was preserved on an 800-kg slab of sandstone. Our team dragged it away from the known location and buried it until we could raise funds to airlift it to safety with a giant logging helicopter. It is now on display at the Western Washington University geology museum. Children love it!